Arm lift surgery is a procedure used to reduce excess skin and/or fat in the upper arms. Also known as a brachioplasty, arm lift surgery aims to improve the appearance of the upper arms through surgically contouring better proportions and making the skin smoother and tighter. Arm lift surgery addresses the area from the upper arm under the armpit down to the elbow. During arm lift surgery, excess skin and fat are removed while the underlying supportive tissue is smoothed and tightened re-defining the shape of the arms and reducing localized fat pockets in the process. Where is it done? Your arms lift surgery will be performed at Honeysuckle Day Hospital in Newcastle, a fully licensed and accredited state of the art day hospital which specializes in cosmetic surgery. Length of surgery: Usually between 2-3 hrs. Maybe longer depending on type and complexity of breast enhancement surgery that is performed. Type of anaesthesia: General Anaesthesia or Twilight Sedation coupled with Local Anaesthesia. Costs will vary according to the complexity and amount of time required for the surgery. Dr. Verma will discuss this with you at the time of your consultation and his team will provide you with a detailed quote after your visit. Do I qualify for arm lift surgery? If you have excess sagging skin on your upper arms, arm lift surgery might be a suitable treatment option. The ideal candidate for arm lift surgery is someone who has excess skin, but minimal fat. This is often the result of weight loss as skin elasticity is reduced with fat loss. The ageing process also causes a loss of skin elasticity and sagging skin on the upper arms. As weight changes will influence the shape of your body, arm lift surgery is best undertaken when you have reached your goal weight and it has been stabilised for 3 months. Dr. Verma will take a full medical history and examine your arms. He will discuss your concerns with you and then advise of the best treatment option or series of treatments to achieve results. During your consultation, Dr. Verma will take photographs to document your appearance pre and post surgery and record the healing process and cosmetic results. You will have a scar on each arm running from the armpit to the elbow. Dr. Verma will limit the scar length and will work to make the scar in an inconspicuous position. Scars will fade over time. Depending upon the amount of skin and fat to be removed, the type of anaesthesia used will be either general anaesthesia or twilight sedation. Dr. Verma will be able to advise which anaesthesia will be best suited to your needs at the time of your consultation. What are side effects of arm lift surgery? With any surgical procedure, there are risks involved – however, most problems that occur are usually easily treated and settle with time. General risks of any surgery include excessive bleeding, reaction to any of the medications (including anesthesia), infection, poor healing or excessive scarring. What are the risks and complications of arm lift surgery? How is arm lift surgery performed? Are there different techniques? Full arm lift. This is a traditional method where an incision is made from the upper armpit to the elbow. The fatty tissue is then contoured and the excess skin removed. The remaining skin is pulled taut and then sutured in place. 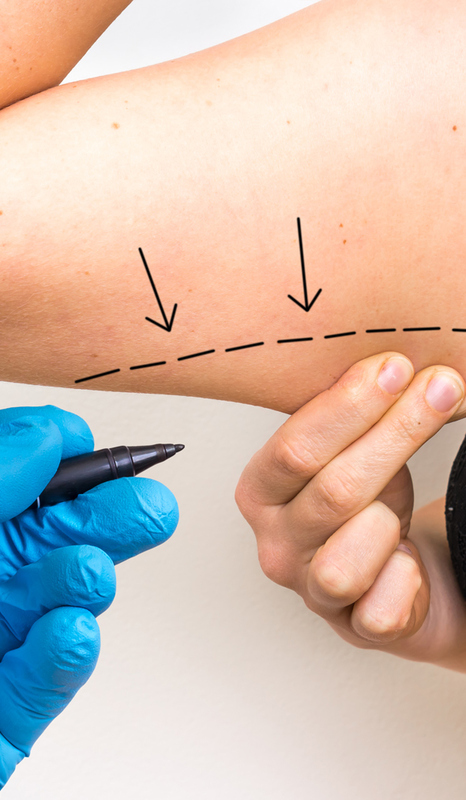 Due to the larger length of the incision, this technique leaves a bigger scar but it is most suitable for patients who have larger amounts of tissue to be removed. Limited incision arm lift. In this method, a smaller incision is made in the armpit and from there excess tissue is removed. This is better suited to patients who have a smaller amount of excess tissue and minimal sagging of the arm. You will be provided with detailed instructions by Finesse Cosmetic Surgery with regards to care of your sutures, wounds etc. however, please note the following. After your surgery, you will have dressings and bandages applied to your wounds. You will also be wrapped in a compression garment designed to minimize swelling and provide support to your surgical site during healing. It may sometimes be necessary to provide a thin tube under the skin to drain away excess blood or fluid that can collect at the site. After your bandages are removed your results will be visible immediately but will become more noticeable when the swelling and bruising from your operation subsides which may take up to 6 weeks. Similar to your consultation visit (see above), Dr. Verma will be taking photographs of your arms in order to document its healing during follow up visits. How long do the effects of arm lift surgery last for? Arm lift surgery is a permanent procedure but is dependent upon stabilized weight. Any significant weight gain or weight loss after your surgery will affect the results.